Recent research shows that at least 80% of unneutered dogs over five years old are likely to be sufferers. Symptoms can include constipation, lameness and difficulties in urination but often no signs are seen, with countless dogs suffering in silence. A simple and affordable test can now be used to check for the disease which, if left untreated, can progress quickly, causing serious health problems. To highlight the issue, Ark Veterinary Centre is taking part in 'Canine Prostate Awareness Month' during November- a month during which the national 'Movember' campaign focuses on the dangers of prostate disease and other health problems in men. A free dog slip lead will be given to owners who bring their dogs in for a test during the month and veterinary staff will be on hand to give advice and explain the most effective ways to screen and monitor their dog for the condition. "Prostate disease is a serious threat to the health of unneutered dogs as they get older but, in our experience, owners can be unaware of the potentially serious health problems it can cause if left untreated," explains Hazel Halliday. "The Movember campaign is a good opportunity to remind dog owners that their pet could be suffering from prostate disease too. Fortunately, both testing for it and treating it is usually simple and affordable and will ensure their dog continues to live a happy, healthy and pain free life. We look forward to meeting owners during November and discussing any concerns they may have about prostate disease in dogs." 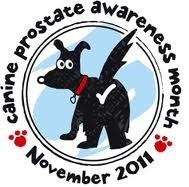 For further information on Prostate Awareness Month, contact the practice.